While the many different types and models of small chainsaws available both online and in the stores give buyers more options to choose from, potential buyers often get overwhelmed by too many options. To make the chainsaw-buying process a little easier for homeowners and anyone looking to buy one. We have compiled, unbiased, and informative reviews on the best small chainsaws. 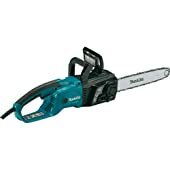 We have also included a tabulated list showing relevant information on the best small chainsaws today. This article is therefore written for the benefit of anyone who wants to purchase a small chainsaw but does not really have a chainsaw model or type in mind. If you just want to look around before making a decision, this article is also for you. For your light-duty tree cutting needs, you need a small chainsaw which is rugged, lightweight and reliable enough to be used for a long duration of time. The Remington RM1425 is an electric chainsaw that you may consider when looking for one. Its main working elements which are the chainsaw and bar are 14 inches in length and have low kickback in case it gets stuck in a branch. To keep this chain from overheating, it’s provided with a push button that you regularly press to squirt the lubricating oil. For chain longevity, there is an external tension adjustment system which allows you to either slacken or tighten the chain depending on the cutting demands. Additionally, a wrap-around hand guard keeps flying debris from your hand as you saw through wood. To power the saw through small branches and saplings, an 8-amp motor is fitted onto it. To roar the chainsaw into life, you simply squeeze the trigger. 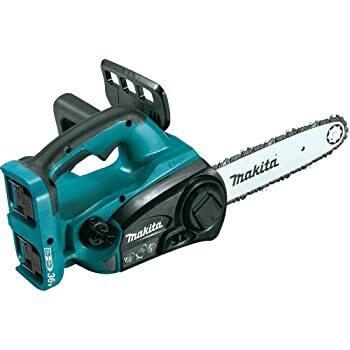 This small chainsaw gives you the benefits of an electric chainsaw of being low weight and compact.With an electric motor, weight is considerably reduced ensuring that you can trim for long without feeling too fatigued. If you are looking for a small chainsaw with enough power to tackle small tasks around your yard, this is the chainsaw for you. It is small in size, light and very affordable. The small chainsaw needs to provide you with faster cutting speeds, ease of maintenance, and protection mechanisms from fatigue and current overloads. These are the exact features you would be getting from the Makita UC3551A. Fitted with a powerful electric motor, the Makita delivers a top chain speed of up to 2,900 Feet per Minute. With such a speed, fast cutting of limbs and saplings becomes a breeze. After completing your work, an electric brake quickly brings the chain to a stop. In the event that a branch is too thick and the motor becomes overloaded, a built-in current-limiter reduces the power to the motor. It is an engineering design put in place to protect the motor from burning out. Another good feature about this small chainsaw is the automatic chain lubrication system. It shifts from the conventional push button which becomes tiresome when you need to keep cutting continuously. The reservoir for this oil has a clear window for knowing when to re-fill it. As you go about your work, your comfort is important just as the performance of the chainsaw. This saw has a rubberized ergonomic handle which absorbs the small amounts of vibrations produced by the moving parts. To make the process of starting the saw easier; a large trigger is fitted onto the handle and turned to start the saw once squeezed smoothly. Guide bar bearing comes out on occasions. Cordless chainsaws provide you with a certain degree of convenience that lacks in either corded or gas chainsaws. You can bring it along (provided it has some battery charge) and worry less about fumes in the process. 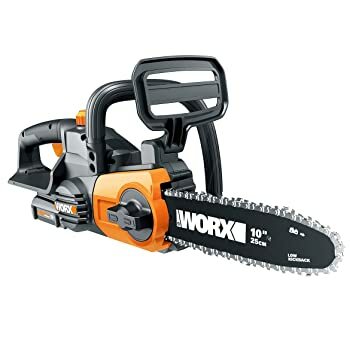 Powered by a 20V battery, the Worx is one of the best small chainsaws out there. With this battery, you can power your small chainsaw as well as other 20 volts Worx tools if you own any. The rechargeable battery powers the motor which in turn drives the 10 inches chain bar and chain. Such power makes it cut cleanly and fast. The ease of use and smooth running of this saw is quite impressive. An auto lubrication system eliminates the task of having to press a button every time to lubricate the bar. Alongside the auto lube, there’s an auto tension system that ensures the chain has the right tension for a clean cut. What if you want to trim branches higher up the ground? Well, this small chainsaw is compatible with an optional extension pole thereby adding 10 feet of extra height. A lightweight, yet compact design makes for a fatigue-free usage on any outing. 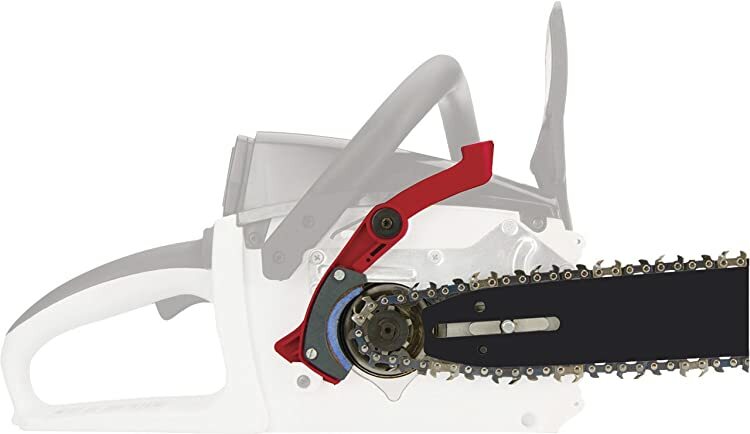 To further provide you some relief, an ergonomic handle that’s comfortable on the hands is fitted onto the chainsaw. 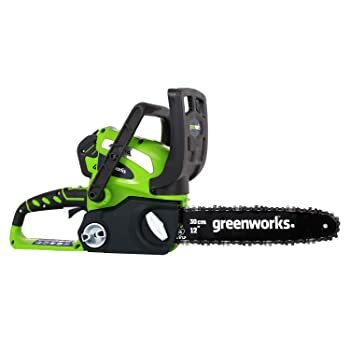 The Greenworks is another cordless chainsaw which is great for trimming small twigs, tree limbs and saplings. 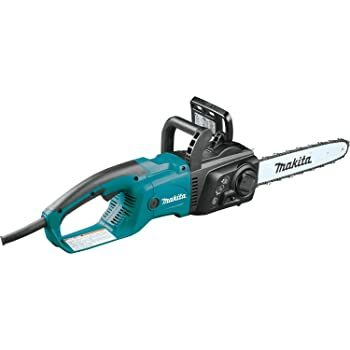 A high-performance G-MAX 40V battery powers this power tool through the different tree limbs that you will be trimming. This battery made from Lithium-ion delivers a longer lasting charge. The power provided by the battery is then harnessed by the motor which then develops the needed torque delivered to the robust 12 inches steel bar and chain. It is this chain that does the work on your property. A chain with a pitch of 3/8 inches is fixed on the bar to deliver the right amount of capabilities for limb trimming and cutting. This chain and bar are kept lubricated at all times when the chainsaw is running the automated oiling system. The wrap-around handle gives you a multi-position cutting possibility to suit your working angle. In a way, the comfortable handle reduces awkward working positions which result in backaches. Fatigue is minimized further by the reduction in the number of vibrations, weight, and noise produced by the tool. If you own an array of other Greenworks tools, then the 40 volts battery that comes with this product is compatible with the other range of tools. 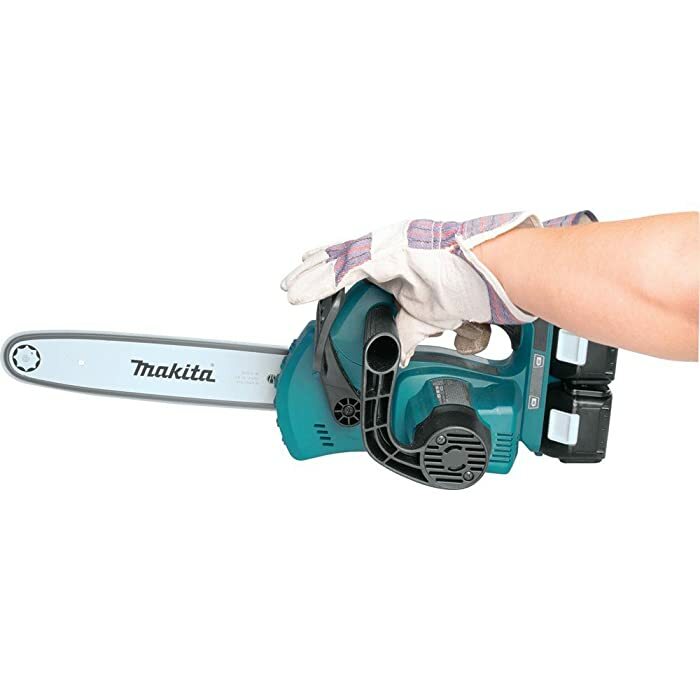 The 12” cordless Makita is another option you could consider apart from the corded option. 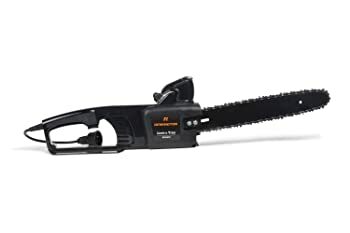 If you are looking for improved portability but an almost similar performance as its electric counterpart, then this chainsaw will come in handy. It has an inbuilt motor that is powered by two 18 volts LXT Lithium-ion batteries. This brings the total to 36 volts that are needed to deliver an impressive runtime that your work demands. However, these two batteries have to be bought separately. When plugged in, the batteries produce enough power through the motor to deliver a chain speed of up to 1,650 feet per minute (FPM). This speed is great for light duty tree limbs trimming work. The chain’s movements are guided by a 12” bar which keeps it in place and ensures the chain does not slip off even at high speeds. With time, the chain will tighten or become loose. To correct that, use the tool-less chain adjustment system. Apart from convenience, it prolongs the lifespan of the chain. User comfort is another great feature of this chainsaw. Its sound levels are measured at 89 dB(A). Which is sufficient for providing ear and neighbors’ comfort as you work. Since this tool is cordless, there is little to no maintenance work to worry about which is a feature that makes it easy to use. Gas powered chainsaws are known to deliver the best performances when it comes to sheer cutting power. 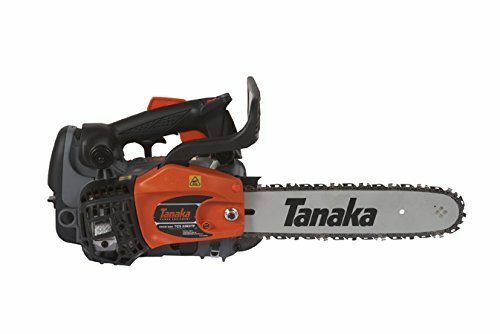 If you want a gas chainsaw, then this one from Tanaka is a good option for the light-duty trimmings you might need to carry out. Powered by a 32.2 cc, 2-stroke commercial grade engine, it delivers enough power to carry out shaping, pruning and hobby work involving cutting tree limbs. Using a pure fire engine technology, the saw assures a powerful yet clean engine performance at a lesser fuel consumption rate. The engine produces the torque required to run the Oregon chain guided by a 12” steel bar. This sprocket nose-bar provides additional control for an easier cut. Starting the engine is easier as it uses the half-throttle choke with a purge primer bulb. An automatic oiler is connected to the gear drive to release lubricating oil provided the engine is running. For tensioning, a side-access tensioner is in place for a quicker and convenient process. There are very many types and models of small chainsaws in the market today. Obviously, having a lot of choices to choose from is great for the chainsaw buyer as you get to choose one based on your needs, your preferences, and your budget. However, the many options available can also make it very difficult for one to choose the right one as many people do get overwhelmed and confused when faced with too many choices. If you are looking to buy a chainsaw, below are some of the factors you should put into consideration to enable you choose one that is suitable for your needs. The first decision that has to be made is the type of chainsaw to be bought. There are mainly three types of chainsaws namely; battery-powered, gas-powered and electric chainsaws. Each of these three chainsaw types has disadvantages and advantages that make it suitable or unsuitable to different chainsaw users. In summary, below are some of the pros and cons of purchasing either type of chainsaw. 1. Most Corded electric chainsaws have sufficient power to handle most of the chainsaw task required by homeowners and the average chainsaw user around the yard. They require little if any maintenance; produce zero emissions and relatively less noise than the gas-powered chainsaws. Electric chainsaws are also smaller in size and relatively easier to handle and carry around. Corded electric chainsaws are also the most affordable chainsaw types. However, the corded- electric chainsaws also have a few downsides. One downside is that they come with a cord which must be plugged into a power source whenever the chainsaw is in use. This makes them less portable as they are tethered to the power source. Sometimes, the cord is not easy to maneuver around as it can get tangled, causing the chainsaw user to trip over it. 2. Battery-Powered/ Cordless Chainsaws: Like the corded-electric chainsaws, they are also quiet, noise-free, and emission-free. 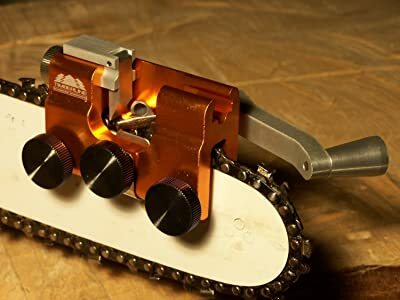 Since they are powered by batteries, they usually have less power capacities than the corded-electric chainsaws and have to be charged from time to time. They also require no maintenance apart from recharging the batteries when they run out of charge. They are however easily portable as they are not attached to any cords. However, they happen to be the most expensive chainsaws. 3. Gas-powered chainsaws are powered by fuel and are usually fitted with two-stroke engines. They are very powerful and often used for medium to heavy-duty chainsaw tasks like cutting and felling medium to large sized trees. However, they produce a lot of noise and harmful emissions and require a lot of maintenance. How much money are you willing to spend on a chainsaw? Obviously, the chainsaw you end up buying must be within your budget. The best thing is that with the many available chainsaw options, it is safe to say that there is something for everyone. If you are going to be using your small chainsaw only a few times in a year, it would be wise to buy a cheaper model as in such a case, it would not make sense to buy a powerful, durable and expensive chainsaw model. However, if you want a good chainsaw that will last for a long time, you can pick one from Husqvarna, Stihl or any other chainsaw brands. While products from such brands are bound to be a bit more expensive, they are usually very durable. It is very important to consider the type of jobs you will be using the chainsaw for when choosing a small chainsaw. For example, if you will be using it only for pruning/trimming tree limbs and branches around your yard, it will be best to buy a smaller electric model that is easy to, maneuver. However, if you intend to be cutting up logs and felling large trees, a gas-powered model with more power will be more suitable for the job. A chainsaw is no play-thing. It can be very dangerous especially if handled by a person who does not have enough physical strength to use it. However, there are many small chainsaws that are suitable for someone who for whatever reason cannot handle a heavier saw. When choosing a chainsaw, make sure that you can comfortably use it before you take it home. Safety features are very important when choosing a chainsaw. They help protect you (the user) from chainsaw kickback and generally from getting hurt while operating the chainsaw. If you are not very conversant with chainsaw use, it is important to choose a model that has many safety features in order to minimize the risk of chainsaw accidents from occurring when you will be using the chainsaw. Generally, gas-chainsaws require a lot of maintenance in order to perform well and last for many years. You as the chainsaw owners/ user will have to clean it out from time to time, change the oil, and clean the chainsaw and so many other things. If you are looking for a chainsaw that requires little or no maintenance, a battery powered or an electric-powered chainsaw will be more suitable for you. Buying a small chainsaw should not be a rash decision. Before settling on any one model or seller, it is important to thoroughly consider the factors above, read other customers’ online reviews and to shop around for the best deals. What one chainsaw user may consider the best chainsaw, will not be the best chainsaw for all other chainsaw users. Ultimately, the best small chainsaw for you will be one that you consider suitable for you in respect to the work you will be suing it for, your needs, and your budget.